This Healthy Quinoa Salad is packed with colorful vegetables and tossed in an easy peasy whisk-and-pour Mediterranean dressing. 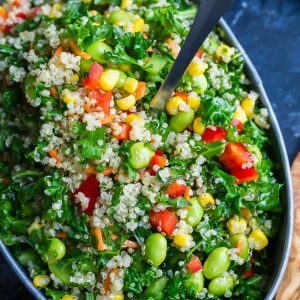 I cannot WAIT for y'all to try this superfood salad packed with edamame, kale, corn, peppers, carrots, and quinoa! First rinse and drain your quinoa using a mesh strainer or sieve. Bring a small pot to medium heat and lightly toast the quinoa to remove any excess water. Stir as it toasts for just a few minutes. This step is optional but really adds to the nuttiness and fluff factor of the quinoa! Next add your water, set burner to high, and bring to a boil. Once boiling, reduce heat to low and simmer, covered with the lid slightly ajar, for 12-13 minutes or until quinoa is fluffy and the liquid has been absorbed. While the quinoa cooks, wash and dry your chopped kale (I use my trusty salad spinner) and massage with a drizzle of oil and a pinch of salt for extra-tender kale that tastes GREAT! Toss kale with shredded carrot, bell pepper, and green onion in a large bowl. Next steam edamame and corn per package instructions and set aside to cool. For the dressing, combine all the ingredients listed in a small bowl and whisk together. Additionally you can add all the ingredients to a lidded mason jar and shake well. Once your quinoa is ready, fluff with a fork and season with salt and pepper, to taste. For a chilled salad, allow the quinoa, edamame and corn to chill in the fridge for 15-20 minutes. For a room temperature salad, simply set aside to cool off slightly and then add to the rest of your veggies. Ready to eat? Pour half dressing over salad and mix well. Allow friends/family to add additional dressing to taste. Have fresh oregano and/or basil on hand? sweet! Fresh herbs have a more mild flavor so you can totally use a little extra of each, to taste. I like to make a big batch of steamed corn and edamame at the start of the week so I can toss it into salads, rice, and stir-fry dishes all week long. Feel free to follow suit! Meal prepping? This salad can be kept in the fridge for easy weekly meal prep or as make-ahead prep for a party or gathering. Simply add more dressing before serving as the quinoa and veggies will soak up all the deliciousness in the fridge. You can also store the dressing and salad in separate containers and combine before serving. Easy peasy! Nutrition facts below are an estimate provided by an online nutrition calculator. Salad calculated before dressing is added.